Forging collaborative links is more important than ever for our sector, especially in this time of constrained resources. Collaboration is so central to what we do as scientists that it can almost seem unnecessary to mention, and it is such a given that the word can receive lip-service rather than detailed consideration. There are many good reasons why we value collaboration at SVI. We welcome our staff’s collaborative skills because willingness to collaborate suggests an openness that is a great cultural advantage. A successful institution is one where people exchange their data and thoughts openly, rather than being guarded, secretive or isolated. This leads to excellent people being attracted to work at SVI. Collaboration also makes sense because of efficiency – sharing leads to greater access to funding, facilities and ideas, and two heads are better than one in solving a problem. This is especially the case if those two heads come from different backgrounds and have complementary skills. And it is more likely that successful application of knowledge will occur with a multi-disciplinary team. Collaborative papers attract more attention and are cited more often than studies from just one group. Communication about our collaborative efforts also addresses community concerns about duplication of research effort. Medical research is often described as extremely competitive and while we are often asked who our competitors are, we think a lot about our collaborators as well. These two might, for better or for worse, work inversely from a geographic point of view. It is easiest to collaborate with people you see every day, nearby. 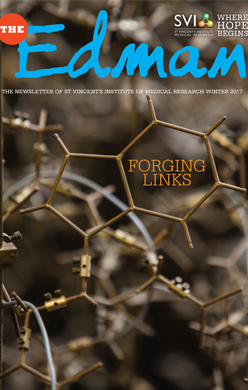 For us, this means researchers and clinicians from St. Vincent’s Hospital, nearby universities, and our colleagues at other independent medical research institutes. 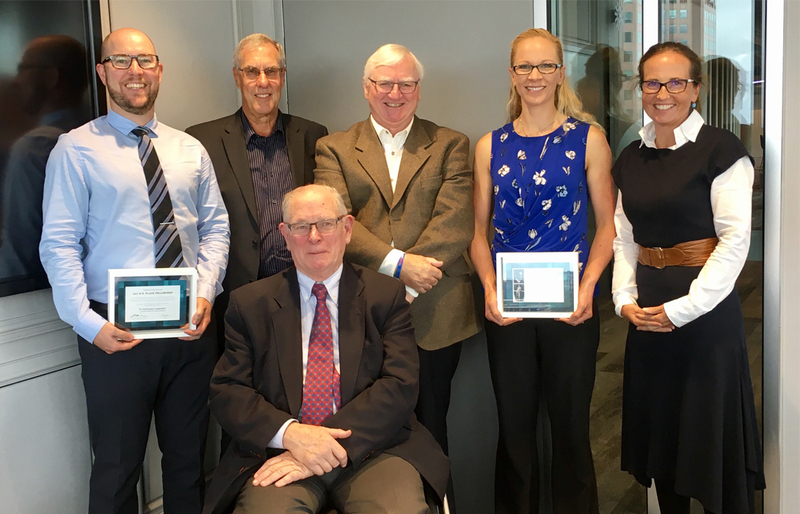 SVI had a successful year in 2016, with a very good outcome in research grants from the NHMRC. There were many outstanding achievements throughout the year which you can read about in this edition of The Edman or in more detail in our recent Research Report. We thank the SVI Board and Foundation Board for the remarkable work they do and we also acknowledge the support and guidance of the St Vincent’s Health Australia Board and the Trustees of the Mary Aikenhead Ministries. Finally, thanks to you, our supporters, for the generous donation of your funds, time and interest to SVI over 2016. In April 2017, Dr Chris Langendorf from SVI’s Protein Chemistry and Metabolism Unit was awarded a Fellowship from the Marian and E.H. Flack Trust. The Fellowship is a new scheme designed by the Marian and E.H. Flack Trust to address career security issues faced by talented, yet unsupported, young scientists and to enable retention of the best scientific talent. The grant will help Chris further his research into understanding the enzyme AMP-activated protein kinase (AMPK), which controls energy production and usage within the cell. AMPK plays an essential role in regulating the cell’s use of energy. It does this by sensing the cellular levels of a molecule called AMP. As energy is consumed, the levels of AMP build up in the cell and bind to three specific sites in the AMPK protein. In keeping with this important role, AMPK has been implicated in a myriad of diseases, from type 2 diabetes and obesity, to cancer, sleep apnoea and depression. Chris explains that the holy grail for researchers and the pharmaceutical industry is the development of drugs to either activate or inhibit AMPK in a cell-specific manner. For example, targeting AMPK in cancer cells would reduce their ability to access the energy required to grow, without affecting other cells; while targeting AMPK in specific cells in the brain could reduce appetite and become an effective treatment for obesity. Decades of effort from researchers and millions of dollars of investment from pharmaceutical companies has led to the development of chemical activators of AMPK. By understanding how these chemicals interact with AMPK, Chris hopes to be able to improve their properties for use in human trials. In an article published in 2016 in the journal, Nature Communications, Chris and his colleagues determined the structure of one of the AMPK activators, called C2, which he had ‘docked’ into the AMPK protein. He was surprised to see two C2 molecules bound to AMPK at a location that was distinct from the sites where AMP is known to bind. Chris hopes to use this unexplored site to design new drugs with the potential to influence the outcome of diseases in which AMPK plays a role. As the microscope field comes into focus, you see a corpulent cell, sitting in the middle of a grey background. Seconds pass, and smaller cells start energetically buzzing around the big cell. One makes contact and pauses, glows bright green, as if to convey its delight, and starts vibrating in place. You can’t see as the smaller cell injects a lethal bundle of proteins into its chosen victim. The big cell slowly turns red, indicating that its nucleus has been breached and its death is now inevitable. Although the process takes place in a culture dish, it mimics the interactions that occur deep within the pancreas of someone who is developing type 1 diabetes. In these people, the smaller cells, aptly called killer T cells, attack and destroy the insulin-producing beta cells. Consequently, people with the condition must inject insulin in order to regulate the levels of sugar in their blood. SVI’s Associate Professor Helen Thomas, postdoc Dr Prerak Trivedi and their team in the Immunology and Diabetes Unit, have recently been able to reverse type 1 diabetes development in mice that are prone to the disease. They achieved the feat using repurposed drugs, called JAK inhibitors. The drugs are currently being trialled for the treatment of rheumatoid arthritis and alopecia areata – a rare form of spot baldness. These conditions, like type 1 diabetes, are caused by an aberrant immune system attacking and destroying cells of the body that it should normally ignore. When the researchers administer the JAK inhibitor, called AZD1480, to newly diagnosed diabetic mice, the disease is reversed. Helen says that their studies provide a solid basis for translation into human trials. The effectiveness of the treatment can be seen vividly in Helen’s cell cultures. When the drug is added to cultures of beta cells and T cells, the smaller cells sniff around the big beta cells, but they don’t vibrate in place as they do in cultures without the drug treatment. After a short time, with nothing to pique their interest, they wander off in search of other jobs to do. Jock’s grandmother was one of only six women to graduate from Melbourne Medical School in 1911. She had six children, three of whom became doctors and two, nurses. Jock says that his grandmother opened his eyes to the mechanical nature of the heart and lungs by doing experiments in their kitchen at home. Inspired by this early exposure, he went on to complete a medical degree and a PhD. Recently, Jock has been researching how the architecture of the blood vessels in an individual’s heart might influence the risk of dying from a cardiac event. 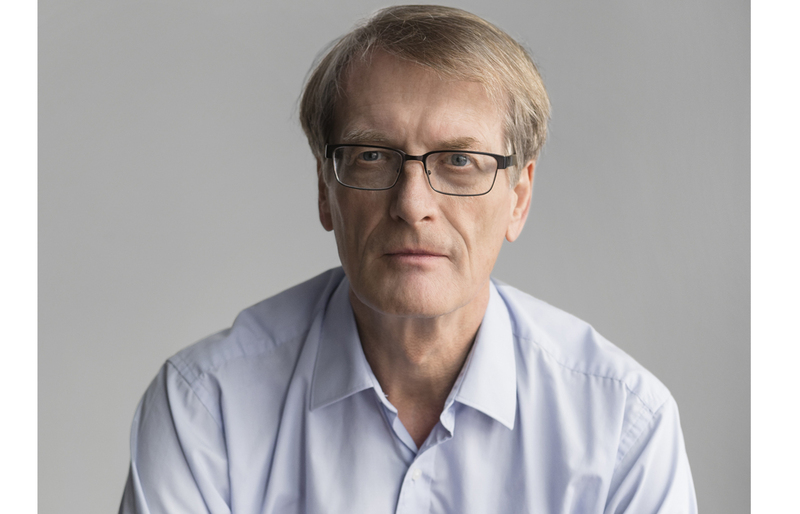 Jock’s current work derives from his detailed analyses of biopsies from people who agreed to provide a bit of extra heart tissue for research when they had cardiac surgery. “The research suggests that people with fewer blood vessels may be more susceptible to having a heart attack, possibly because they have less pathways that the blood can use to detour around a blockage,” says Jock. Jock is validating these findings using heart tissue sourced from the Victorian Institute of Forensic Medicine. Jock says that there is a mountain of analysis still to be done on the samples that he has collected. And despite the fact that this work is far from the kitchen experiments that Jock performed with his grandmother, the family tradition continues. Yao Sun says that her mother felt nervous about sending off her only daughter from Changchun Airport in China’s north-east. It wasn’t just because Yao had never travelled overseas before – she was leaving for a 3-year stint in Melbourne to complete her PhD. 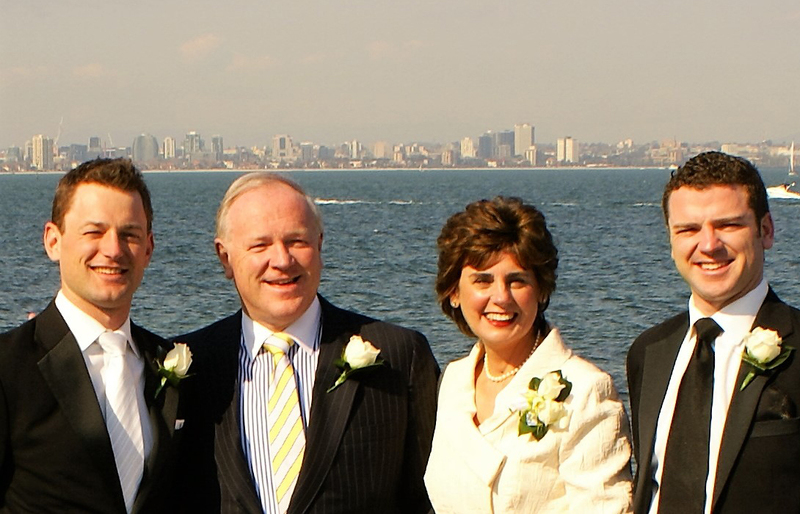 “My parents and I had never lived apart. They were really worried about how far away Australia is and were concerned about how I would cope on my own.” But the idea didn’t intimidate Yao. 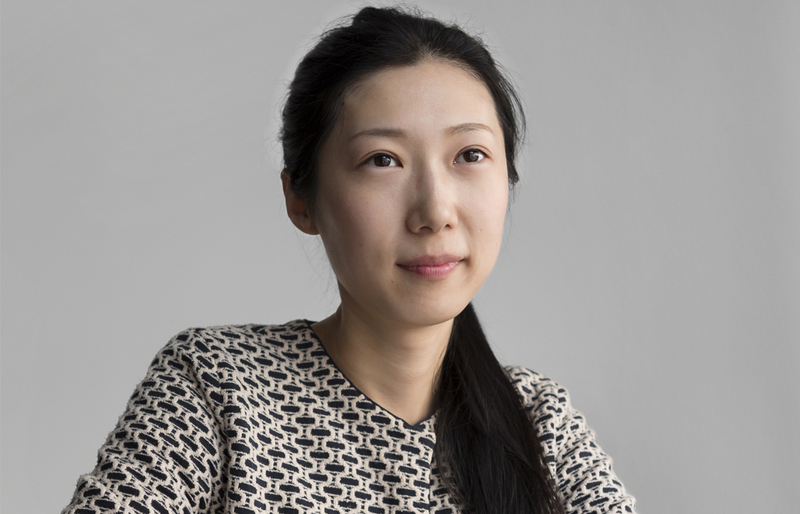 Yao was offered three postings – in Hong Kong, Germany and Melbourne – and carefully examined the University rankings in order to decide on the best place to get her training. She eventually ended up at SVI, working in SVI’s Bone Cell Biology and Disease Unit, supervised by Associate Professor Natalie Sims and Emeritus Professor Jack Martin. Her supervisor, Natalie, says, “Yao was one of the top ranked students in her University class – it’s easy to see why. When you get a student as keen and intelligent as Yao, it can make a real difference to the productivity of the lab,” Natalie says. Yao’s parents also now feel confident that their daughter is in the right place. They even plan to make their rst trip to Australia this year to visit her. Tim had his first transient ischemic attack at age 54. “A year later I had my second attack. That’s when I started to realise I was actually very mortal. When I was younger, I gave little consideration to ageing and associated diseases, even with a family history of heart disease and stroke. In 1978, my father had died at the age of 63 of coronary heart disease. In October last year I was sitting watching The Grand Final and suffered an episode that saw me lose peripheral vision in my right eye. While it concerned me, I had no idea I had suffered a stroke. The following morning I decided I should go to the Eye & Ear Hospital for a check up. ‘You’ve suffered a stroke’, I was told and ‘There is nothing that can be done to recover your impaired vision’. I felt myself swept up in fear and uncertainty. Further tests, examinations, consultations and diagnosis indicated I had ulceration of the carotid artery in my neck, coronary artery disease with an aneurism in the main artery, a branch bundle blockage in the left side of my heart and a very high calcium reading. I was very fortunate to be offered a place in a trial study that was being undertaken. Together with my supportive and caring wife we travelled to the hospital each week to attend lectures and physio classes. I began to gain insight and understanding of my illness and I discovered I had choices and my best chance rested with my attitude and to take positive action. I’ve lost 12 kilos in 5 months and have reclaimed a lost wardrobe of clothes. My wife and I go walking for an hour a day - rain, hail or shine and we are together making plans, dreaming about our future - this is not ‘squeezing in some additional activity’. My medication has reduced and I have removed 4 blood pressure tablets from my daily intake after 30 years of consumption. 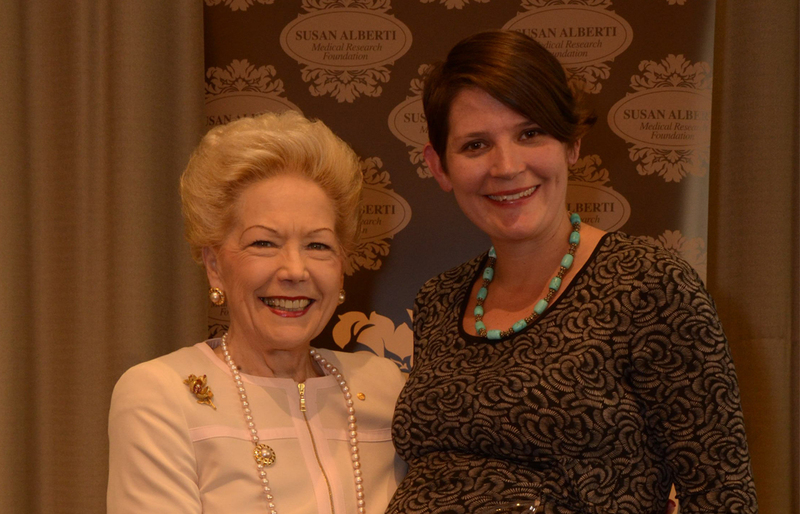 Dr Jacki Heraud-Farlow is the recipient of the 2017 Susan Alberti Medical Research Foundation (SAMRF) Women in Research Award, presented on May 11th at the 5th Annual SAMRF Mother’s Day Lunch. Jacki’s twin daughters were born just a few days after the award ceremony. Jacki researches a pathway that allows normal cells in healthy people to “edit” double-stranded RNA molecules. This process is essential to remove structures that would otherwise look very similar to the genome of an invading virus. Unfortunately, some children are born with mutations in this pathway, meaning their immune systems can no longer tell the difference between “self” and virus. Their cells mount an autoinflammatory response that results in a profound neurodegeneration and loss of motor and communication skills early in life. There is currently no treatment for this disease, termed Aicardi-Goutieres syndrome (AGS). Jacki hopes that her research can shed light on how this process works in healthy people and children with AGS. 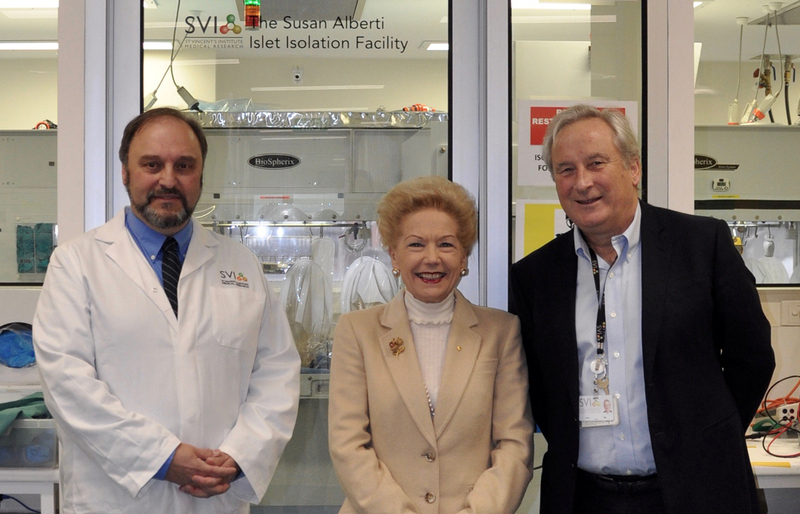 On Friday May 25th, SVI formally named its Islet Isolation Facility in honour of Susan Alberti AC. Each year, a number of SVI’s Honours, Masters and PhD students receive top-up scholarships from the SVI Support Group. This financial support allows them to focus on their studies, without having to worry about how to pay their living expenses. This year’s group includes Jane Xu, Yao Sun, Karen Gu, Wilson Castillo, Alishaya Murali, Marie Christensen, Ashley Ovens, Brendan Stevenson, Bronte Johnstone, Jen Cheung and Sean Oh. This year’s Support Group Dinner is being held on Thursday 19th October.